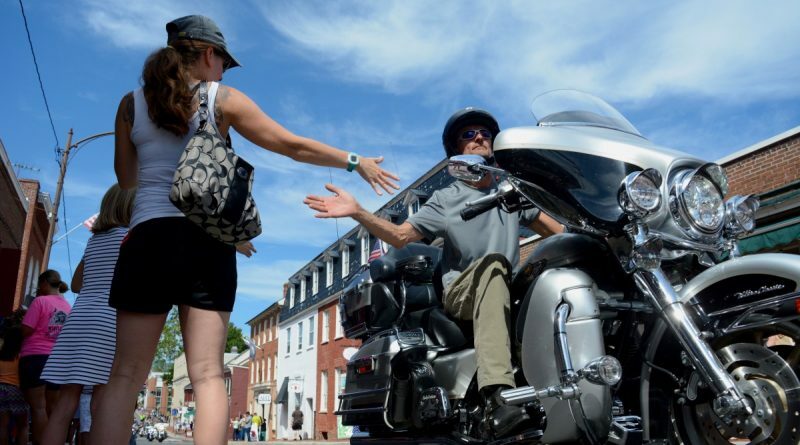 For what organizers say will be the final time, hundreds of people lined King Street in downtown Leesburg today to cheer the massive parade of motorcycles participating in the America’s 9/11 Foundation memorial ride. The annual ride, which begins in Somerset, PA, and stops at the Pentagon today before ending at Ground Zero in New York City on Saturday, honors the memory of those who lost their lives in the attacks on Sept. 11, 2001. The procession included some 1,200 motorcycles and took more than a half hour to pass through town. Many horn-honking riders took photos and videos of the crowd—some flag-waving and others just waving—that lined the streets to witness the event. The ride started in 2002 and participants have said the ride through Leesburg is always a highlight of the trip because of the large and enthusiastic crowd. For more information, go to americas911ride.org.